After completing two single and two double eliminations in the past three competition days, today started very relaxed for the riders and crew with the skippers meeting at midday. In the first few days here at Costa Teguise we’ve seen strong wind and pumping swell as well as slightly lighter wind and less wavy conditions. All the riders were putting an a great show that amazed the crowds watching on the beach. With no chance of finishing another double elimination the final result was already announced yesterday. 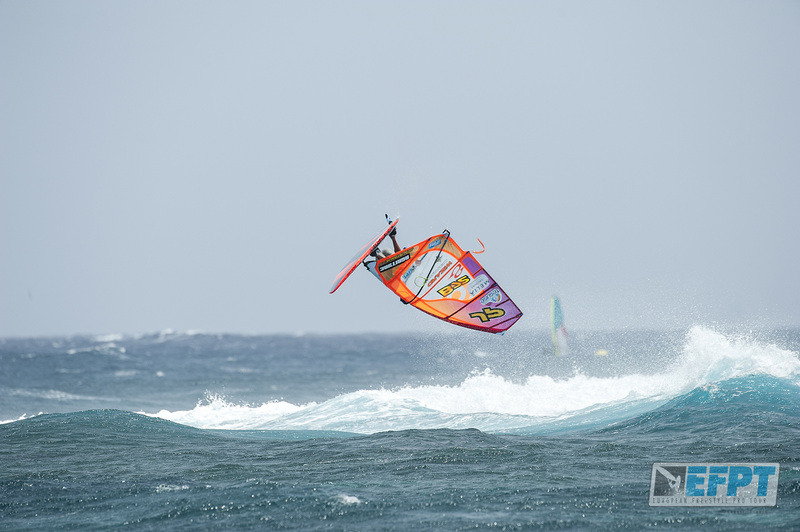 Steven Van Broeckhoven (JP/Neilpryde) who had to take almost the whole season off competing in 2015, proved once again how complete his windsurfing skills are. The Belgian sailor was not only performing great in the waves and howling winds but also in lighter, more challenging conditions. Second on the podium after two double eliminations is Frenchie Adrien Bosson (North/Fanatic) who is hunting for the European Freestyle Pro Tour title in 2016. The rider from the South of France showed a great routine in all of his heats, combining power moves and big jumping maneuvres. Third has been Jacopo Testa from Italy, who signed up very late because he was meant to compete in the Italian Championships that had to be called off on very late notice. Testa was definitely one of the most impressive riders of this competition and it seemed that his contest sailing was spot on. Equal fourth point-wise have been European Champion 2015 Amado Vrieswijk (JP/Severne) and Belgian freestyle talent Yentel Caers (JP/Neilpryde). 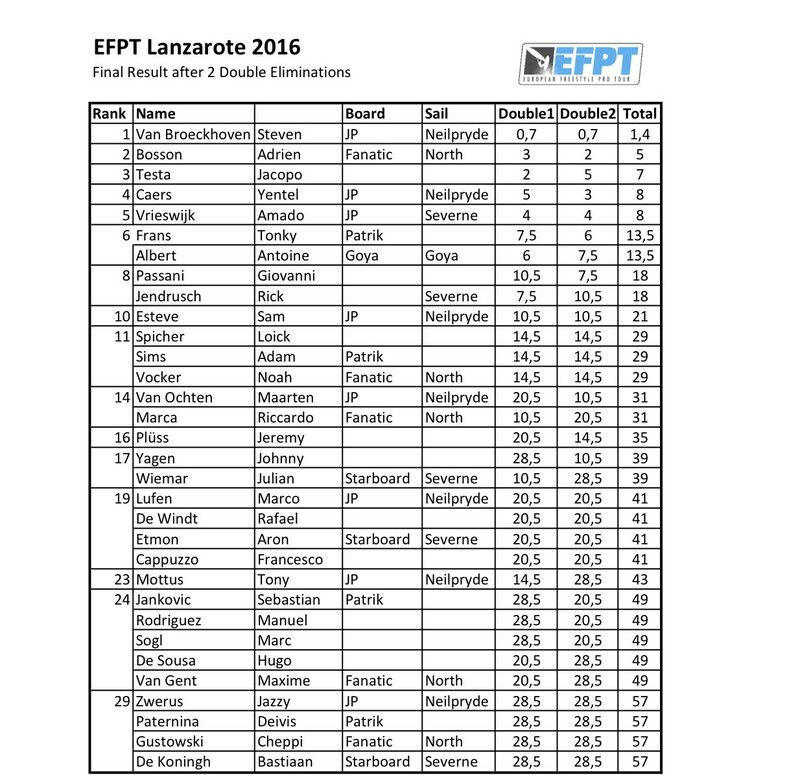 With the tie-break rule, Caers could remain on 4th position and dismissed Vrieswijk to the 5th place. To provide some action for the riders and the spectators on this final day a super cross funrace was organised for the afternoon. Twenty riders signed up to compete in two semi-finals of ten participants respectively. Five riders of each heat advanced to the final. Amado Vrieswijk who is also competing in slalom was leading his qualification round and the final heat straight away. Steven Van Broeckhoven became second and Adam Sims (Patrik Diethelm) third. All riders and judges seemed to have a lot of fun and the atmosphere on the beach was amazing. The prize-giving will take place tonight in the beach bar of the Melia Salinas hotel, located directly at the spot. We are looking forwards to a nice evening with all the riders, crew and spectators. 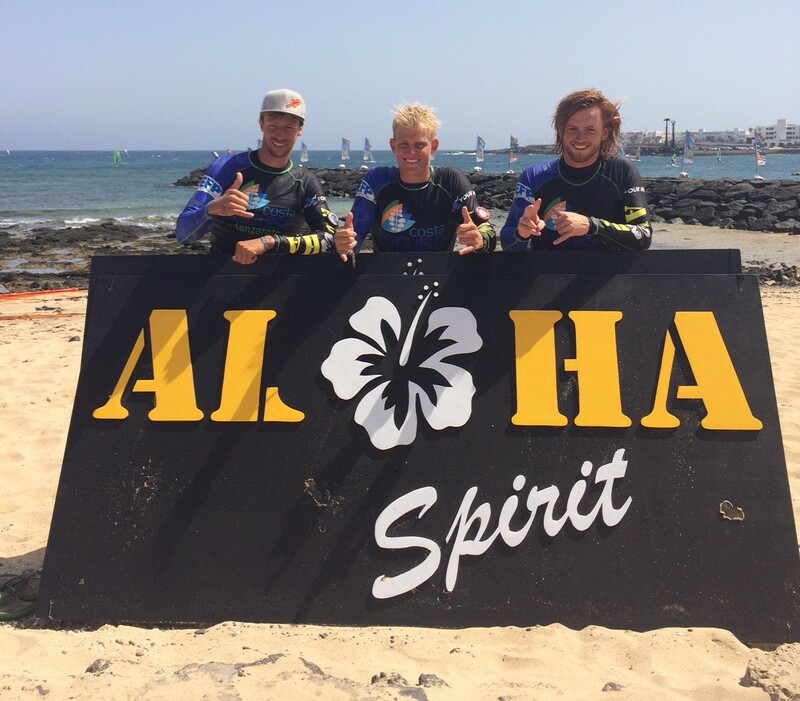 Tomorrow most of the sailors will travel onwards to Fuerteventura where the next freestyle Worldcup will be taking place. 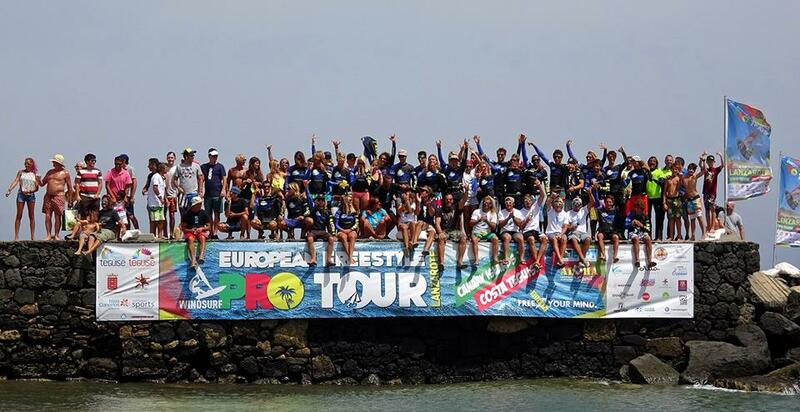 We are looking back to a great event here at Costa Teguise, Lanzarote and are looking forwards to return next year.